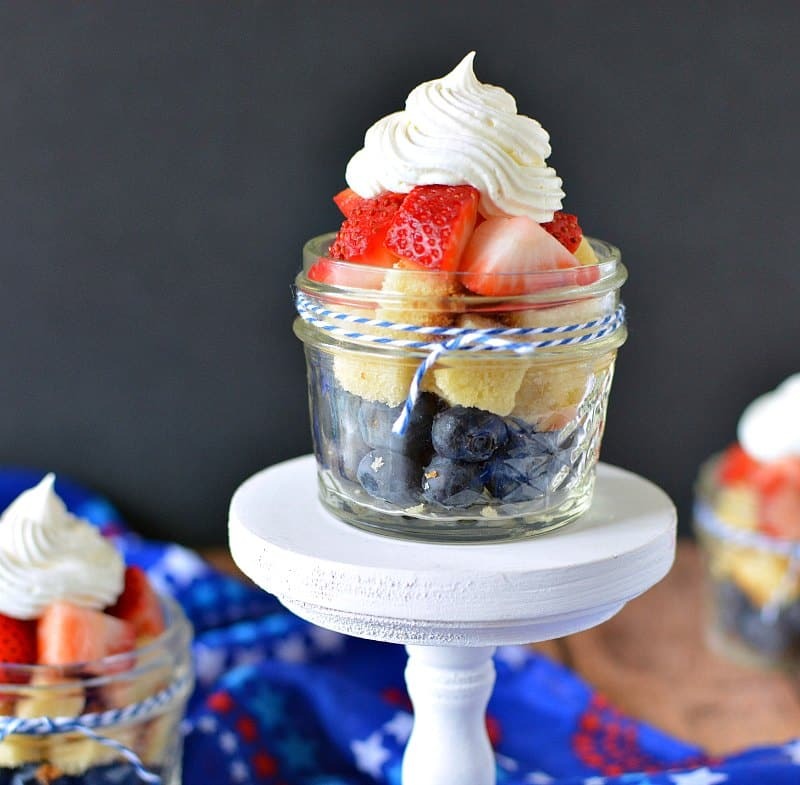 Easy and festive, red, white and blue mixed berry shortcake in jars are a fun Fourth of July treat. There are many things to love about summer. Fresh berries and the fourth of July are just two of them. I love combining the two to make festive red, white and blue food. In the past we've made Red, White, and Blue Fudge and Red, White, and Blue Homemade Ice Cream. Both are super fun red, white and blue recipes. 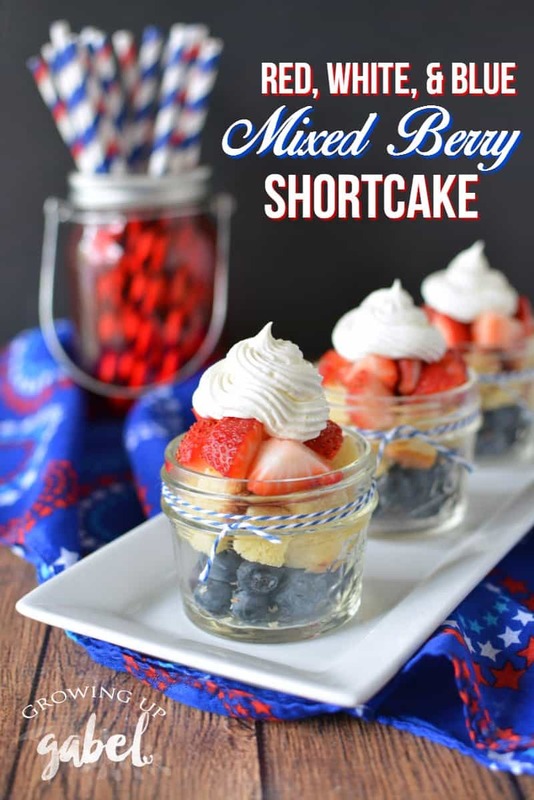 This year, carry on the tradition with red, white and blue Mixed Berry Shortcakes. Mixed berry shortcakes couldn't be any easier to make. 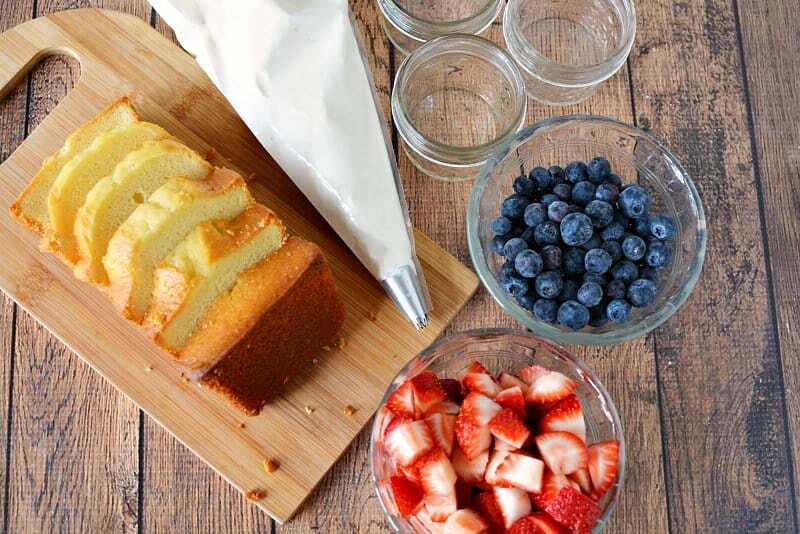 You'll need a frozen, prepared pound cake for the shortcake with fresh berries. You can make homemade whipped cream, but the whipped topping in a tub holds up a bit better in the summer heat. 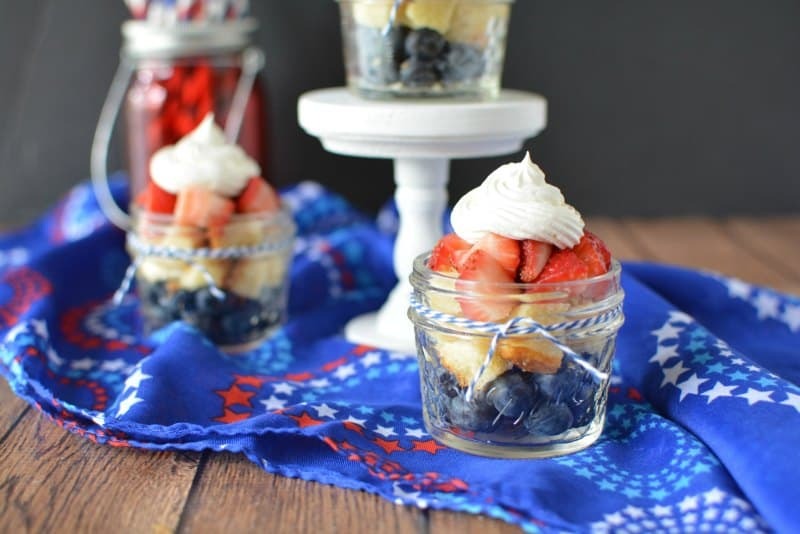 Making the shortcakes in jars is just cute and fun! Plus they are easy to eat for a party. 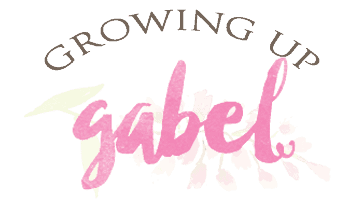 We used small, 4 oz glass canning jars. 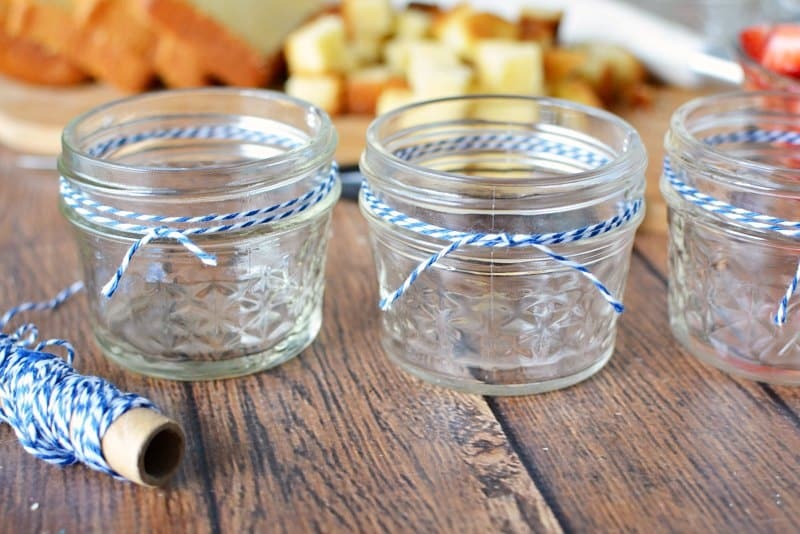 For decoration, wrap baker's twine around the jars before making the short cakes. Using a bread knife, cut the pound cake into small cubes. Leaving the cake just slightly frozen will help keep the crumbs to a minimum and get more consistent cubes. You can also make a pound cake, or use a yellow cake. We also have made homemade shortcakes and those could also be cut up. 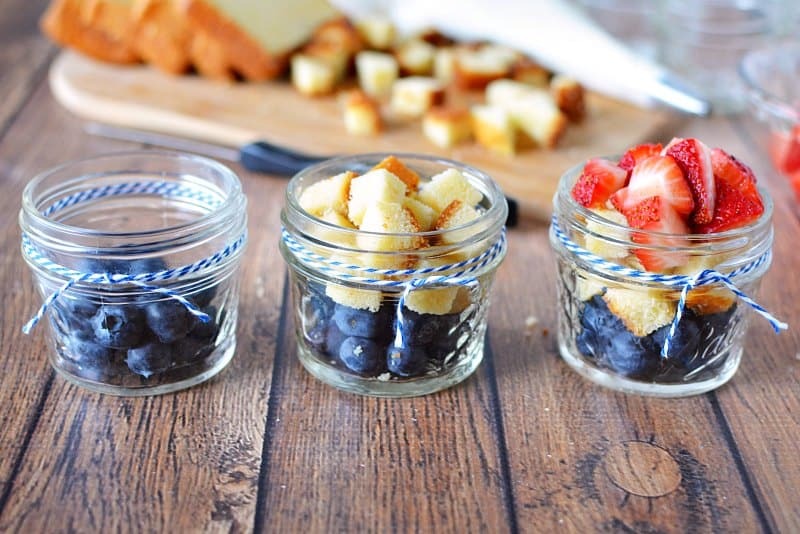 Layer a handful of blueberries, pound cake and strawberries into the jars. You can do any order you like best. To get pretty whipped cream, scoop the whipped topping out of the tub, and put it in a pastry bag. Pipe the whipped cream topping on top. You could also add a little whipped cream in between the layers. Cuz who doesn't love a little extra whipped cream? Serve these mixed berry shortcakes for an easy dessert at dinner or for a summer party. Using a bread knife, cut the pound cake into small cubes. 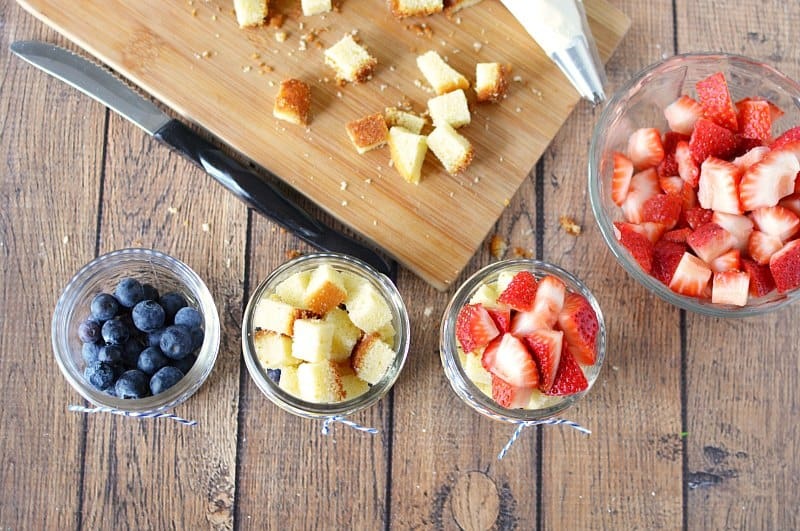 Layer a handful of blueberries, pound cake and strawberries into a small mason jar. I love this idea! Thank you for sharing at Fiesta Friday party! These look so refreshing and tasty, Camille, and your photography is amazing! 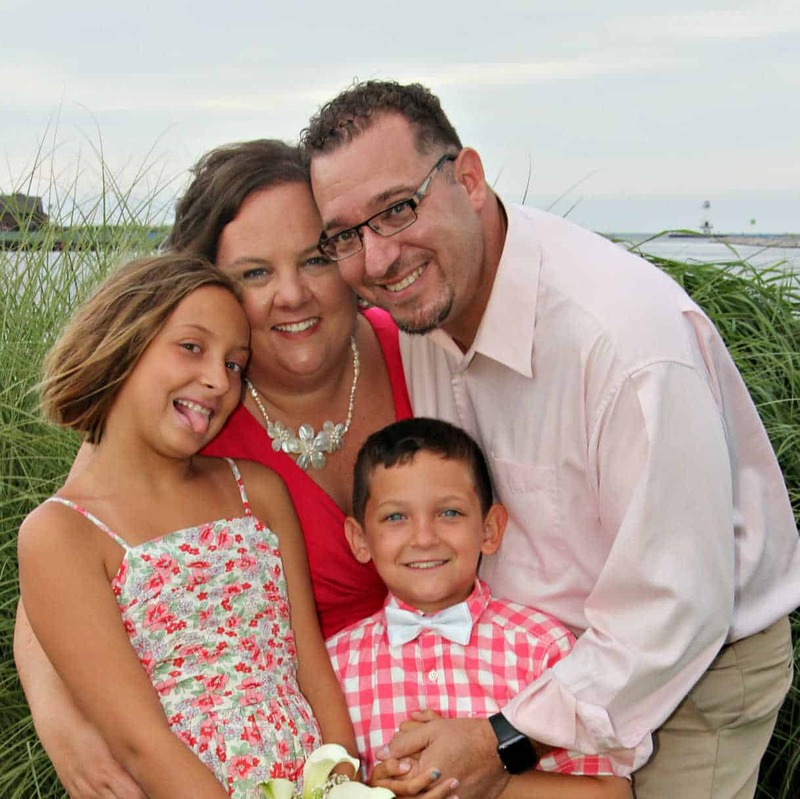 Thank you so much for sharing at Project Inspired.